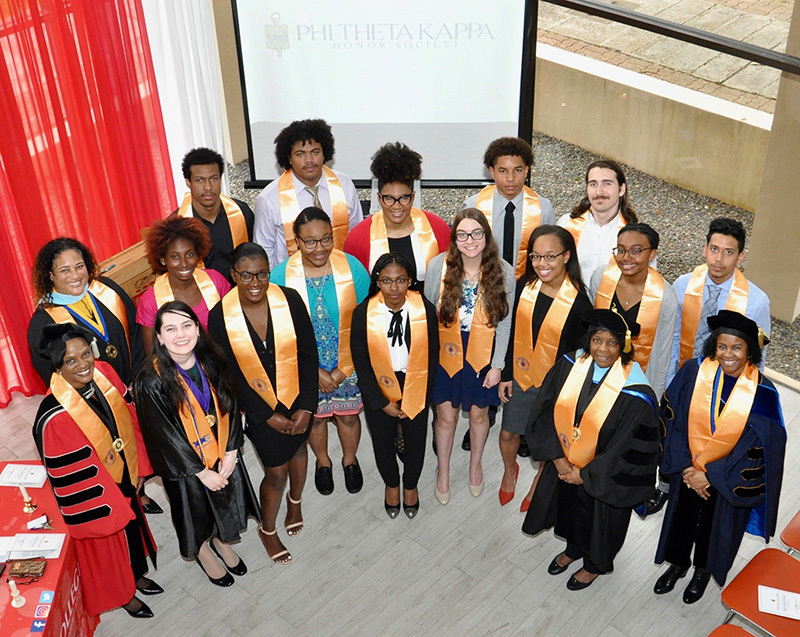 Bermuda College has announced the launch of a local chapter of the prestigious Phi Theta Kappa National Honour Society. Phi Theta Kappa recognises academic achievement of college students in two-year colleges, and provides opportunities for them to grow as scholars and leaders. Its foundational pillars are scholarship, leadership, service and fellowship. The inaugural induction honoured 15 Bermuda College students who attained grade point averages of 3.5 during an evening ceremony hosted by the College. Keen Collard, Jaiden Furbert-Jacobs, Atiya Furqan, Kaitlyn Jeffrey, D’Hstiny Seaman, Demetria Packwood, Samaria Paynter, Danielle Smith, Naphisa Smith, Dukarai Richardson-Burgess, Jordyn Richardson, Seth Samuels, Ken-Nie Trott, Rickie Williams and Kiara Virgil-Wainwright have become the first students inducted into the inaugural chapter. Guest speaker for the ceremony was Amanda Kapinski, past International Officer and current Alumni representative of Phi Theta Kappa. In her address, she encouraged the new members to make the most of the opportunity this new chapter afforded. Vice President of Academic & Student Affairs at the College, Dr. Phyllis Curtis-Tweed noted, “The installation of the new Beta Chi Upsilon Bermuda Chapter of Phi Theta Kappa underscores the vision of Bermuda College as a centre for academic excellence. Ms. Scott added, “PTK creates many opportunities for our students beyond the international recognition of their academic achievements. Active engagement opens the door to a level of research scholarship that is generally perceived to only occur in four-year institutions. Phi Theta Kappa is the largest honour society in higher education with 1, 285 chapters on college campuses worldwide. Congrats President, staff and students. Excellent, Congratulations Kaitlyn and fellow students, Well Done one and all, Keep Going Strong, Oh Yeah, YOU Can Do It!! !